If I overcharge my laptop battery, will the life span decrease? Question: If I overcharge my laptop battery, will the life span decrease? Overcharge does affect battery life span, it will hurt battery and decrease battery life, so all Li-Ion battery has controller chips to prevent if from overcharge. A Lithium-ion battery may be damaged by extensive overcharging (continuously on a charger for more than 24 hours). Damage to the battery from overcharging would only occur in the very unlikely event of a malfunction of the charging system. Should I Remove the Laptop Battery For A Desktop Replacement Laptop? 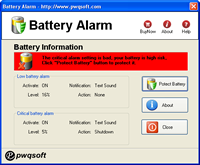 Battery Alarm is battery protection solution for windows laptop, it is designed to protect laptop battery from deep-discharge, the laptop battery may last for 3 years or more after using this software. 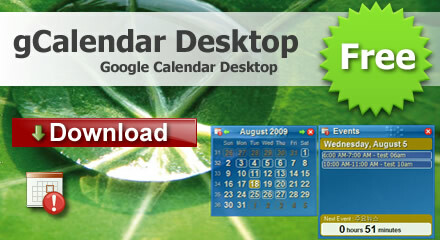 gCalendar Desktop is a google calendar client and events reminder that lives embedded on your desktop, it completely integrates with google calendar, displays all Google Calendar events in the desktop and system tray. it will the alert message notifying you when the time for next event occurs. Copyright © 2009 pwqsoft. All Rights Reserved.